HP is the leader for the fifth consecutive quarter. It took advantage from its contracts with North America and back-to-school sales. HP has reached the total 9.35 million units. 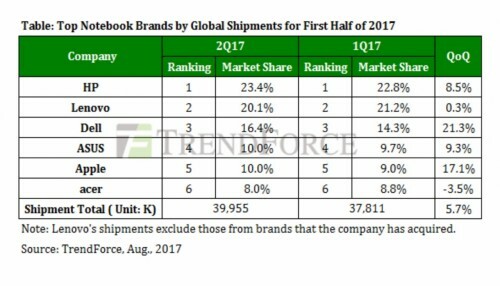 The second place is possessed by Lenovo who shipped 8.05 million units and its shipments are dropping year after year by 2.4%. The decline is caused by slow progress in the Asia Pacific region. The third place is taken by Dell whose shipments increased by 21.3% from the Q1 and 7.4% from the previous year. The company succeeded thanks to North American tenders and increased Chromebook shipments. The fourth place is taken by ASUS. The company decided not to increase shipments but to focus on selling more expensive premium laptops with full HD displays. Currently, ASUS is the leader in shipments of high-resolution portable computers. ASUS managed to sell 3.99 million units and stay on its fourth place. Apple yielded to ASUS only about 400 000 shipments, taking the fifth place on the market. 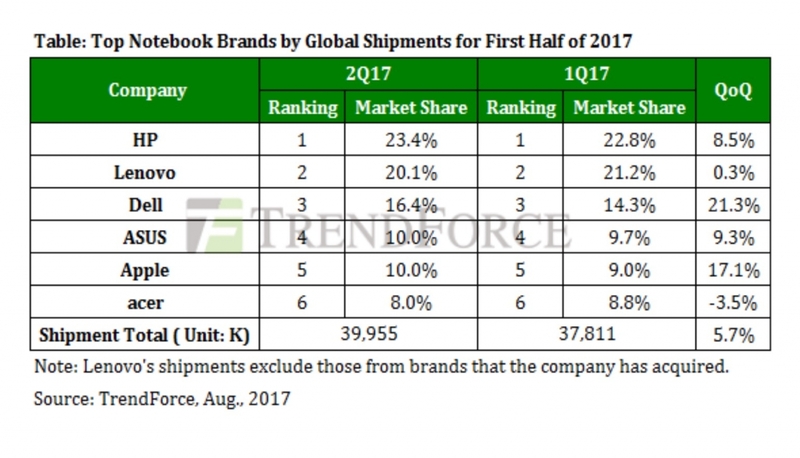 The company sold 3.98 million units but increased its shipments by 17% thanks to 12-inch MacBook update. TrendForce also predicts growth of MacBook shipments for the third quarter. Acer’s on the sixth place now. The company’s shipments have dropped by 3.5% and now its total equals 3.22 million units. The cause of the decline is that Acer is expanding to Chromebook market where the competition becomes dramatic.